It is spring time in the Catalan capital, with spring time comes the outdoor festivities, warm weather and most importantly BBQ. March so far is my favourite season here in Spain. The only downfall to March is when March turns into April, it is the end of the calçots season. Calçot season spans from mid-October to the end of March, with the best tasting calçots in the winter months. The best way to indulge in this Catalan staple? On an open fire barbecue. Calçot Fun Fact: the barbecuing of calçots is called calçotadas. Gastronomic Madness took advantage of the weather and the season and organized a BBQ with Calçots on a lovely spring day in March. Our event was held in Lleida at a private vineyard with 20 people. We had good wine, good company and not to mention the bbq and calçots. Calçots are a tradition in Spain. They are giant spring onions served with romesco sauce. How did the calçot become a Catalan tradition? From asking around, locals have told me that the tradition comes from the area of Valls, which is near Tarragona. Calçot Fun Fact: this region is where calçots are designated a registered EU Protected Geographical Indication. Which certifies that this region has a reputation for its quality of calçots. Legend says that farmers and peasants would add extra soil to the onions as the grew, which resulted in them growing longer. This Catalan tradition also touches on the big interest of barbecuing in Barcelona traditions. 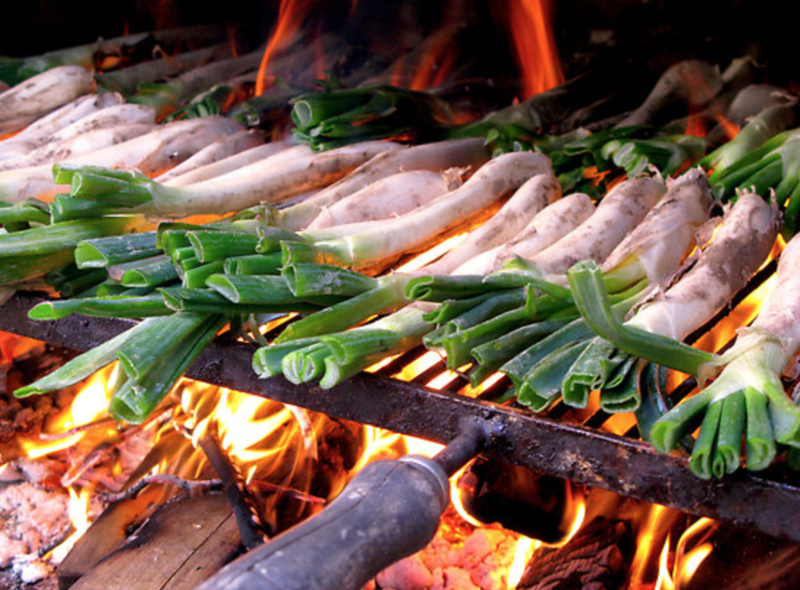 Calçots are cooked over an open fire barbecue. To eat, to peel away the scorched outer layer, and eat the soft insides with a dip or sauce on the side. My favourite part of this tradition is the social aspect of huddling around an open fire with a group of people sharing life stories and food experiences.